Complete set of Engine Repair Parts named Liner Kit is our special offer for our customers. 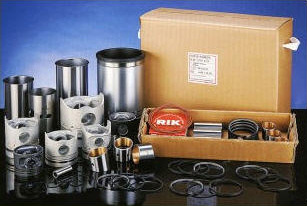 The Liner Kit includes Liner, Piston, Piston Ring ( Imported from Japan RIK, NPR or TP ) and Piston Pin,Bush and Clip. We pack them in the same way as Original. Using imported Piston Ring makes our Liner Kit to high quality enough to win client's confidence and satisfaction. Heavy and Ultra Heavy Liners for Trucks, Trailors, Buses, Ships and Engineering Equipments are experiened more than 25 years, such as Komatsu, Caterppilar, Cummins and so on. Copyright © 2019 KUAN KUNG MACHINERY CORP. All Rights Reserved.